What would make Leave voters change their mind about Brexit? October 27, 2016, 7:10 a.m.
Outside of the result of the EU referendum itself, one of the most satisfying things for Leave voters is that the doom scenarios laid out by the Remain campaign have not come to pass. There has been no punishment budget, no flight of companies from the UK and the FTSE is at near record levels. Remainers of course retaliate that that is because the terms of Brexit are not yet known, and that the pain is being stored up for later. If that pain ever comes, will it be enough to convince Brexit backers that the benefits of leaving the EU are still worth it. In short, what would it take for those who think that the UK was right to vote to leave the EU change their mind? New research from YouGov has found that the factor most likely to shake Leave voters’ resolve would be a significant increase in unemployment – 7% say that under these circumstances they would then oppose Brexit, whilst an additional 13% would no longer be sure about whether Brexit should happen or not. After this, the financial services industry fleeing the UK would persuade 4% of Leave voters to change their mind (plus 7% no longer sure), whilst the introduction of EU tariffs on UK goods and the price of groceries rising 10% would persuade 3% of Leave voters to change their mind (plus, again, a further 7% would no longer be sure). British people needing a visa to travel in Europe and Scotland leaving the UK and were the least likely to change people’s minds on Brexit (although 21% of Scottish people who think voting to leave the EU was the right thing to do would change their mind if it resulted in Scottish independence, compared to 3% of British people with the same view). Nevertheless, whilst the margins might be small, any of these scenarios would be enough to tip the balance of public opinion from thinking Britain was right to vote to leave the EU to thinking Britain was wrong to vote to leave the EU (excluding don’t knows). Whilst these specific scenarios are enough to reverse approval of the referendum result, they are obviously dependent on those events coming to pass. And herein lies one of the problems for those seeking to keep Britain in the EU: Leave voters essentially see Brexit as a no-risk proposition. 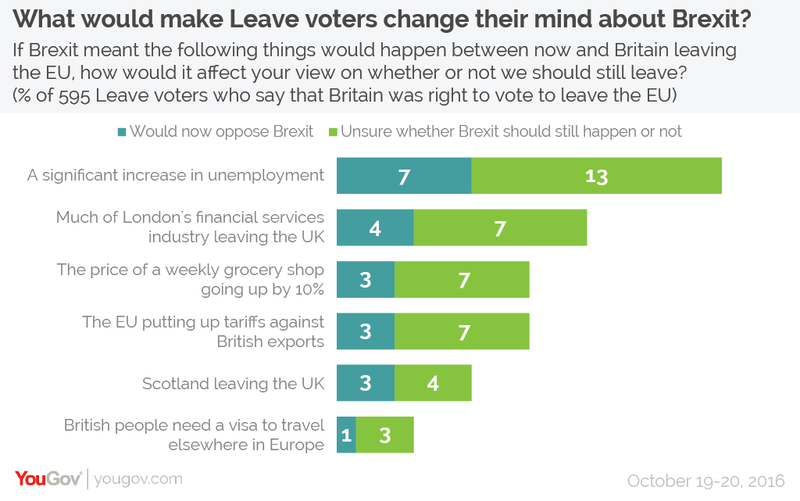 The overwhelming majority of Leave voters believe Brexit will either make things better, or at least not make things worse. Of all the negative side effects of Brexit, the one Leave voters are most worried about is that the price of their weekly shop will go up. However, just 25% of Leave voters think this is likely to happen, fewer than half the number who think Brexit will make no difference to the price of groceries (57%). Just under a quarter (24%) of Leave voters also think that the British economy will get worse in the short term as a result of Brexit – but this drops to just 3% in the long term. Additionally, fewer than one in five Leave voters (18%) believe that #marmitegate was the harbinger of future grocery supply problems. Otherwise, fewer than 10% of Leave voters think that Brexit will have any other negative effects – just 8% think it will mean their personal finances get worse, 4% think it means their access to public services will get worse, and 3% think that their own job will be less secure (rising to 5% of Leave voters who currently have a job).